Fuxian Lake stretches out through Chengjiang County, Jiangchuan County and Huaning County in Yunnan Province, about 60 kilometers to Kunming City, spanning an area of 212 square kilometers. 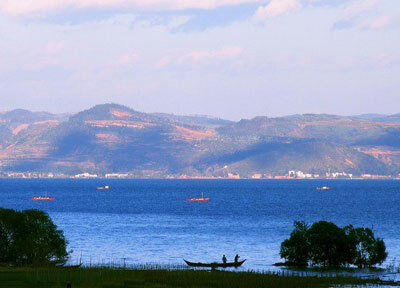 The lake is ranked third largest in Yunnan, right after the Dianchi Lake and the Erhai Lake. Also the deepest lake in Yunnan, it is 155 meters deep at its greatest depth. One day, Geng Wei, a specialized diver, found a strange phenomenon under the lake. He discovered many stone materials, including flagstones and stone strips with thick moss above them, could be seen. Geng Wei believed the stones might be from a remote time. However, why were they underwater? Where did they come from? With these questions, Geng remember a mystical legend about the lake . Local people often said residents could see a city-like silhouette under the lake from the nearby mountains on a fine, calm day. Was it the ancient city mentioned in the legend? In order to explore this riddle, Geng dove into the waters some 38 times to carry on surveys. He finally wrote a report to notify related official departments and experts in Yunnan Province of his findings. To unveil the mystery, a Chinese submarine archaeology team stationed in Fuxian Lake also became involved. Members had discovered lots of blocks scattered on the lake bottom. With the advanced use of detectors, they saw stones that formed a wall seen on a sonar display along with various flagstones. High stairs appeared in front of them. Flagstones covered with moss seemed to reveal an ancient sunken city. The team members found the scope of the site under Fuxian Lake was extremely big, and the traces of construction were everywhere. After several days of observation and analyses, experts estimated the scope of the area is between 2.4 square kilometers to 2.7 square kilometers. Where is it from? Some experts speculate the site might be the ancient city of Yuyuan, which disappeared mysteriously many hundreds of years ago.